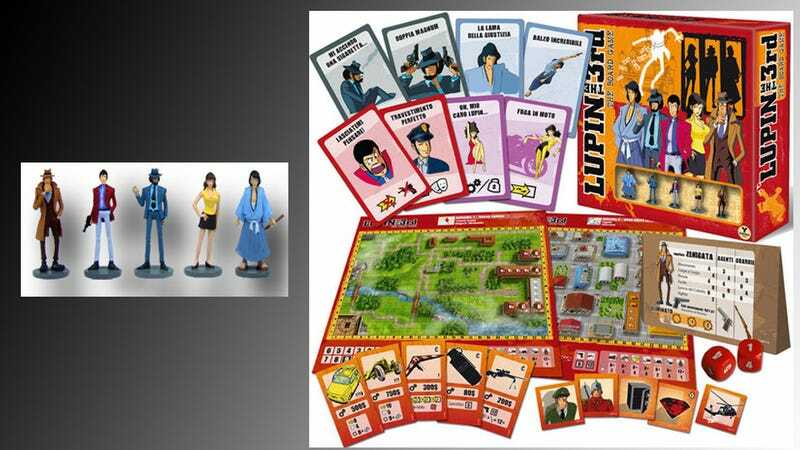 Finally, a Lupin III Board Game! While I may never get to play the cel-shaded Castle of Cagliostro video game of my dreams, I was happy to hear that the Italian board game publisher Ghenos Games will be putting out a board game based on the adventures of the animated film's protagonist, Lupin III. (And hey, from the sound of things, Level 5's Ni No Kuni is as close as we're gonna to get to a playable Miyazaki film. And by the sound of things, that's gonna be just fine by me). At the end of the second television series, Lupin and his gang are looking for their next heist and trying to decide between "Red Ruby" in Burma and "The Great Bank Robbery" in Switzerland. Players choose to play the role of Inspector Zenigata and his agents or Lupin III and his gang or just one character. The gang's goal is to steal the treasures and escape from the law, while Inspector Zenigata wants to arrest them. Be aware of Fujiko, however, for while she usually works with the others, she occasionally exploits Lupin's interest in her to steal the treasure for herself. The game is broken into a number of phases, with Lupin's gang moving "invisibly" via notes that they keep in a log out of the view of whomever is playing Inspector Zenigata. Fujiko is the party's X-factor, since she "may betray the party at any time" and make off with the treasure. I'm considering getting this game just for the awesome-looking cards and character pieces, but the game itself sounds like a lot of fun, too. In the meantime, guess it's time to rewatch The Castle of Cagliostro and track down Series 2 of Lupin III, which I never actually finished.